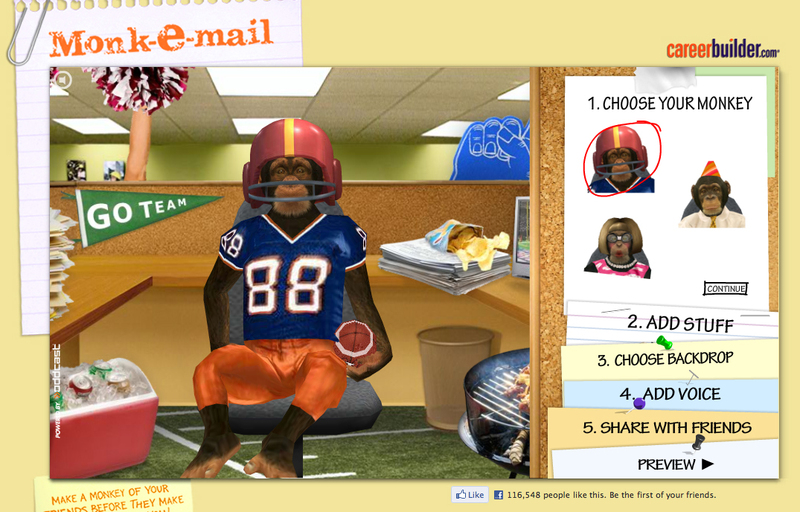 Careerbuilder.com is bringing back the Monkey campaign for the 2011 Super Bowl, reviving the popular chimpanzees campaign from 2005 and 2006. After a five-year hiatus, the chimpanzees are back at work at Yeknom Industries (monkey spelled backwards), creating chaos and high jinks for the only human employee in the firm. “Parking Lot”, the 30-second spot to be screened during the Super Bowl on February 6, is one of three new commercials developed in-house that will appear through various venues throughout the year. From a business trip gone awry to an unorthodox fire safety meeting to a “car sandwich” in the company parking lot, the chimpanzees are all about monkey business. The Monkeys campaign was dropped in 2007, possibly in response to pressure from animal rights groups such as PETA. Careerbuilder.com appear to have weighed up the risks of alienating public opinion, considering the popularity of the original advertisements. A statement on the humane treatment of chimpanzees has been placed on the Careerbuilders site. Monk-e-Mail, first launched in 2006, has been rebranded in version 2.0, enabling users to send messages featuring talking monkeys (CGI) to friends, colleagues and family. 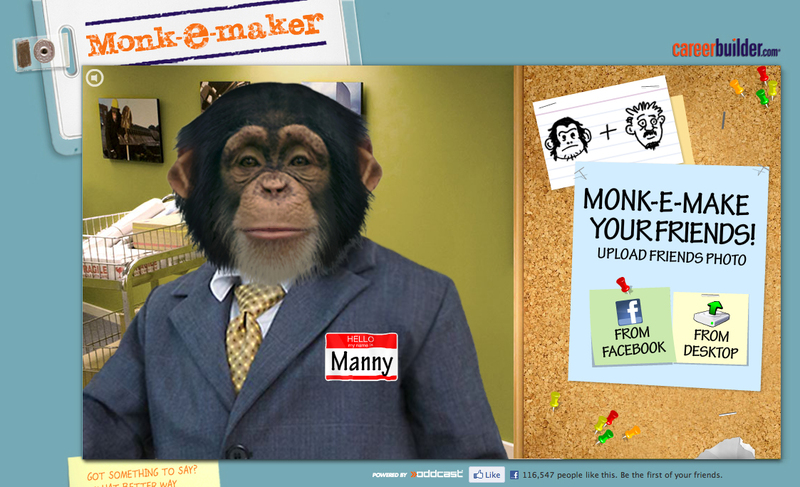 Monk-e-Maker enables users to upload pictures and see what their boss, their co-workers, their social network friends and others would look like as a monkey. In the Yeknom Facebook Game, to be launched the week following the Super Bowl, players fight their way up the corporate ladder at Yeknom Industries by completing work tasks such as getting coffee or washing the boss’s car. Mischievous chimpanzee co-workers cause mayhem to throw the player off his/her career path. The Monkeys campaign, first developed at Cramer-Krasselt, Chicago in 2005, was revived in-house for 2011, by producer Ben Latimer, creative director/art director Matt McIntyre, creative director/copywriter Jeff Martin, chief marketing officer Richard Castellini and VP marketing Cynthia McIntyre. Filming was shot by Bryan Buckley via Hungry Man with assistant director Craig Owens, director of photography Scott Henriksen, executive producers Dan Duffy, Kevin Byrne and Cindy Becker, line producer Mino Jarjoura, production designer Steve Ruggieri. Animals were trained by Steve Martin at Steve Martin’s Working Wildlife with trainers Chris Edrington and Keith Bauer. Editor was John Dingfield at Beast Editorial, Chicago with assistant editor Matt Glover, producer Lauren Scheuer, executive producer Melissa Thornley. Visual Effects were produced at The Mill by lead Flame artist Gavin Wellsman, colorist Fergus McCall, Flame artist Danny Morris, assistant Flame artist Gigi Ng, Albert Cok, Suzanne Dyer, Rosalind Paradis, junior assistant Flame artists Brian Houlihan and Randy Krueger, smoke artists Jeff Robins, Keith Sullivan and Tristian Wake, CG artists Jeff Dates and Sandor Tolado, producers Dan Roberts and Zu Al-Kadiri. Sound was designed at Machine Head by sound designer Stephen Dewey and executive producer Patty Chow Dewey. Music was produced at Emoto, Santa Monica, by composers Ryan Elder (Parking Lot), John Adair (Business Trip) and Paul Bessenbacher (Fire Safety), with executive producer Paul Schultz. Audio post production was done at Another Country by mixer John Binder, assistant mixer Louise Rider, executive producer Tim Konn, and associate producer Cathi Fremer. Interactive components were designed at Oddcast.